Great for reverb or phase splitter. Black plate dissipates heat better. Balanced: When the plate current draw of each triode is the same, we refer to that as having balanced triodes. High Gain: Tubes that measured to have higher gain. 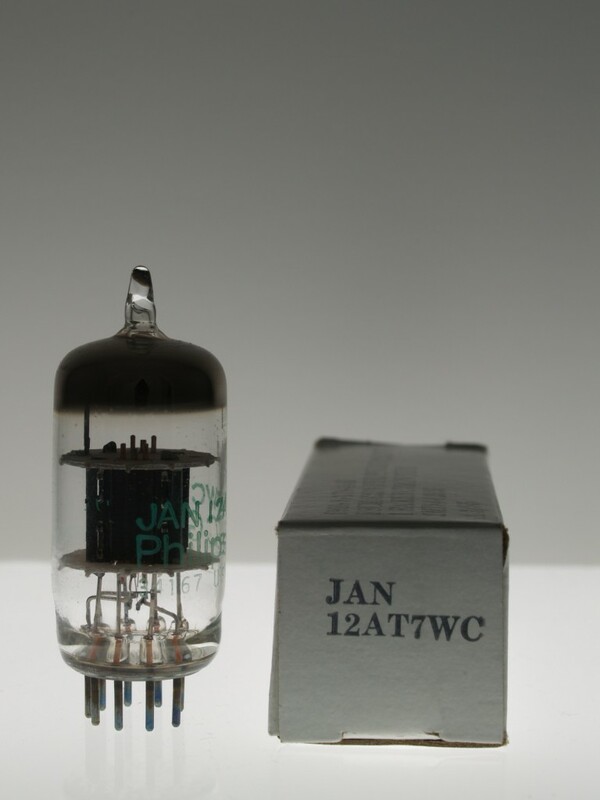 Matched: Each triode of the preamp tube has matching gain. Early Distortion (Groove Tubes - # 1-3) is best for a softer attack, and those who play a lot of rock and blues solos. Average Distortion (Groove Tubes - # 4-7) is great for your normal all around tone - for those who want some versatility in their sound. Late Distortion (Groove Tubes - # 8-10) is chosen for those who want their sound dynamic and clean - especially Jazz and Bass players.. The JAN 12AT7WC Black Plate is used as a phase splitter, which might need to be changed each time you change power tubes. 80's military prod, green lettering, black plate. Also used as reverb driver in some amps. Sweet blackplate tone. What kind of power tubes does your amp use? © 2002-2018 Doug's Tubes, Inc. All Rights Reserved.